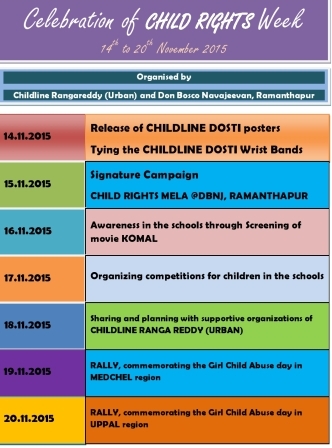 Ramanthapur (Hyderabad) Nov. 14: A Week long programmes and events were planned by the Childline staff of Rangareddy District Urban region and Don Bosco Navajeevan Hyderabad to commemorate the Children day (14th November) and International Children’s day (20th November). The whole nation celebrates as Child Rights week during this week. To make this day as memorable event posters were released on the theme CHILDLINE DOSTI and FAMILY IS MY RIGHT. This was done at two places, namely at Don Bosco Navajeevan Rehabilitation Centre, Ramanthpurar along with a group of students Director and members of management took part in it. While addressing the occasion Fr Sudhakar Bellamkonda Director reminded to all the staff and students that it is the responsibility of every one to make our city a child friendly city and reach those children who are in difficult situations. He also presented to the staff about the weeklong programmes that are planned by CHILDLINE, Rangareddy (urban). As part of our first day event Mr Ramachandrareddy, Deputy Commissioner of Police DCP) released the Poster and child representative tied the CHILDLINE DOSTI wrist bands to all the staff of DCP office. In his short message DCP assured that the children will be protected and will give their full cooperation to address the children issues. Our child representatives along with child line staff also visited Mr. Sd. Rafiq, Assistant commissioner of Police (ACP), Alwal, Police stations, Uppal and L.B Nagar and tied the wrist bands and stuck the posters on the notice boards reminding them of the CHILD RIGHTS week celebrated all over India by Childline Foundation India. On this day we rescued 4 boys from Secunderabad and Kachiguda Railway stations and the good news is that three of them immediately we could contact their parents and restored them back with their family. Another event that was organized on this day was celebration of Children’s day at Mudfort slum. Mrs Shoba, slum teacher, Mr Sravan, Street Coordinator and other staff members spend more than half a day and organized programmes & competitions and distributed them prizes for the winners and snacks for all the children. It is the first experience of celebrating week long CHILD RIGHTS week by us. Our children are enthusiastic to be part of this memorable event. As part of second day programme on 15th November 2015 we are organizing two events, namely, signature campaign for the public to give awareness about the event and to make them active partners in supporting children issues and rights. The second programme that is planned towards evening a cultural programme for the neighbourhood public of Don Bosco Navajeevan Rehabilitation Centre, Ramanthapur.